The Red Bull Theater, founded in 2003 to focus on Jacobean drama (those English playwrights who were overshadowed by Shakespeare) has in recent seasons been incorporating non-Jacobean plays into its offerings, so it’s a pleasure to see the company back on home ground with John Webster’s potboiler The White Devil. Webster is best known for The Duchess of Malfi, perhaps the greatest non-Shakespearean play of the period; The White Devil’s complex plot is inspired by the same Italian family. Lisa Birnbaum plays Vittoria Corombona, and Daniel Oreskes plays her lover, the Duke of Brachiano, in John Webster’s The White Devil. 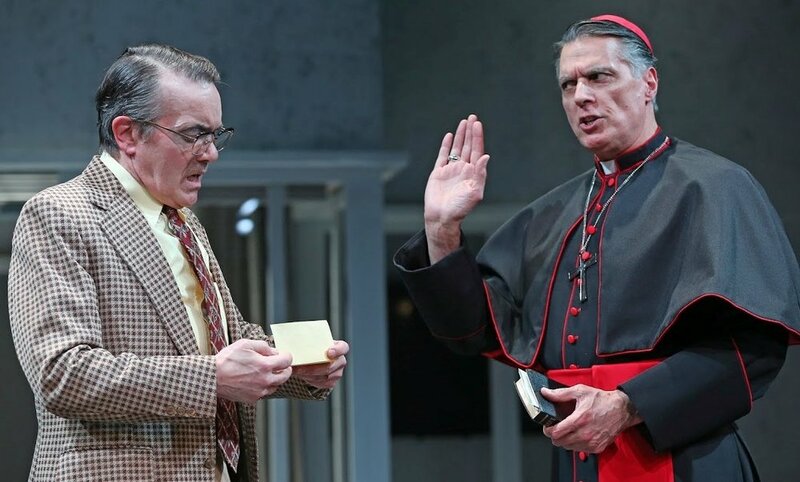 Top: Robert Cuccioli as Cardinal Monticelso, and Derek Smith as Camillo, the nebbish husband of Vittoria. It consists of two brothers and a sister. One brother is Cardinal Monticelso (Robert Cuccioli); the other is Francisco de Medici (T. Ryder Smith). Their sister, a duchess, is married to the Duke of Brachiano (Daniel Oreskes), a profligate nobleman no longer interested in his wife’s virtue; he is intent on having an affair with Vittoria Corombona, a renowned beauty, but one from an impoverished family. Vittoria herself is one of three siblings. Her brother Flamineo (Tommy Schrider) strives to be a fixer and chafes at the decency inculcated into them and their brother Marcello by their mother, Cornelia (Socorro Santiago). Vittoria is married to a dunderhead named Camillo (Derek Smith), but Flamineo wants to marry her off to the well-heeled Brachiano to ensure a comfortable future for both of them. Neither is uncomfortable with the notion that Camillo may need to die first. I’ll talk with you hereafter. Do you hear? I’ll sheath in your own bowels…. Birnbaum with Socorro Santiago (left) as her scornful mother Cornelia. If that couplet resonates in modern consciousness as a reference to church cover-ups, so be it. Indeed, much in The White Devil is familiar: unscrupulous politicians, spoiled children, and Vittoria herself, a woman who becomes a scapegoat for lust when men aren’t held to the same standard. Other rococo twists are laughable—but who wouldn’t be tickled by the idea of a quack doctor who is able to devise a potion that, when drunk, will emit poisonous farts? Jacobean verse is more jagged and difficult to master than Shakespeare’s, yet the cast in Proske’s production is uniformly in control. They speak the words clearly, and make them comprehensible. Although the plot remains an unwieldy element, a bit of extra attention is worth the effort. As if that nature had forgot the spring…. Brachiano comes before T. Ryder Smith (right) as Francisco de Medici, Duke of Florence, while Vittoria’s brother Flamineo (Tommy Schrider, left) looks on. T. Ryder Smith is a smooth, icy Francisco, while Derek Smith excels both as the finicky sad sack Camillo, who carries a pillow around, and the shaggy, ruthless Lodovico. 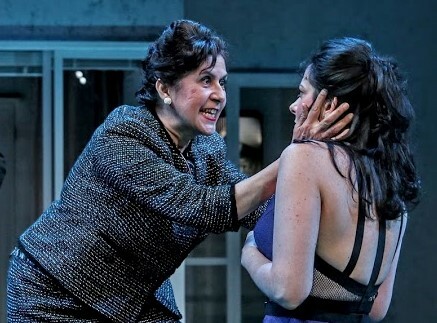 Socorro Santiago is a forceful Cornelia, and Lisa Birnbaum as Vittoria Corombona is by turns ferocious and sympathetic, sinned against and sinning. Her trial scene is especially effective as she calls out Monticelso for persecuting her. Cheri Corinne Rice smoothly navigates both Zanche, a gypsy waiting woman, and the young princeling, son of the duchess, while Tommy Schrider is irredeemably callow as Flamineo. Kate Noll’s glass-walled set works in tandem with videos by Yana Birÿkova, who incorporates the dumb shows of the period into projections of offstage action. Jiyoun Chang’s creepy lighting adds an unsettled feeling as the bloodletting sets in. Jacobean drama can be convoluted, but this is a chance to see it done well. 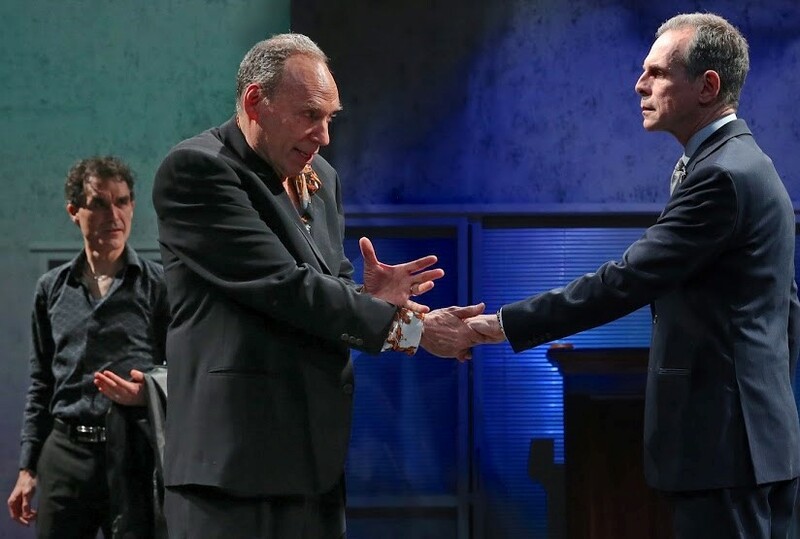 Red Bull Theater’s production of The White Devil runs through April 14 at the Lucille Lortel Theater (121 Christopher St., between Bleecker and Hudson). Evening performances are at 7:30 p.m. Tuesday and Wednesday and 8 p.m. Thursday through Saturday; matinees are at 2 p.m. Saturday and 3 p.m. Sunday. For tickets and information , call (212) 352-3101 or visit redbulltheater.com.